A veritable cornucopia of art, sculpture, jewelry, Western Americana, antiques and collectibles will be on the docket at an upcoming estate auction in Mimbres, N.M.
On Nov. 2 and 3, Desert West Auction Service will be hosting a live auction, while online access to the inventory will be provided by iCollector.com. And with nearly 600 lots on the table over the course of the two days, there will be more than enough pieces of art and other Western and Native American-themed goods available to satisfy even the most discerning collectors. Turquoise has long been a part of American Indian arts and crafts, and several examples of its glimmering beauty will be up for grabs during the first two days of November. 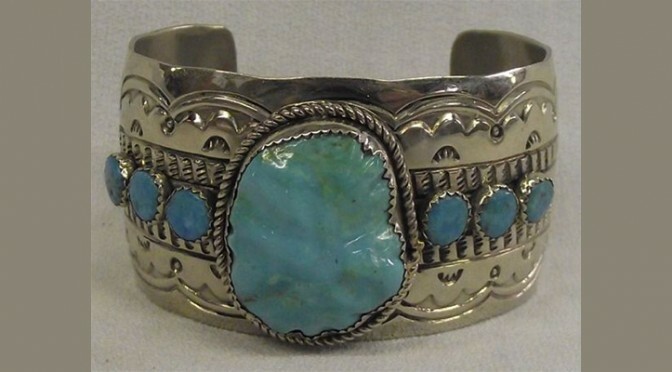 One particularly elegant example is a Navajo German silver turquoise bracelet with a wide cuff and hand-stamped designs (lot #1018). The intricate craftsmanship displayed in the piece serves to magnify the beauty of the turquoise, lending the bracelet a dual role as jewelry and art. And for those who like to add a Native American element to their cowboy aesthetic, a vintage sterling turquoise bolo tie (lot #1019) can be yours for the taking if you head over to iCollector.com before the start of the auction and put in an absentee bid. Not only does this 20th century Potawatomi artist, flutist and dancer have a distinctive name, he also has a singular style to go with it. Nine total lots of his artwork – five in session one and four in session two, many of which are framed and signed – will be procurable at the Desert West auction, and you'll want to get them while the getting is good to add examples of his remarkable work to your collection. An orphan at the age of 7, Crumbo began his impressive career in the early 1930s when he was just 20 years old. He would go on to become a noted artist- in 1939 he was commissioned by the U.S. Department of the Interior to paint murals on the walls of its headquarters in Washington D.C. – dancer and musician. And he even gained fame as a prospector, discovering a lode of beryllium in New Mexico that became one of the greatest mines of its kind in the country. Now you can obtain some of this remarkable man's art, including a framed, hand-signed silkscreen of a Native American warrior mid-dance ritual (lot #1114A). Add pottery to the list of art and artifacts that you can bid on in November. From prehistoric finds – two Mimbres black on white bowls (lots #2057 and 2058), for example – to a more modern black-on-black dynamic Santo Domingo olla by artist Rafaelita Aguilar, there will be plenty of options when it comes to finding pieces that will beautifully complement any Southwestern design motif. 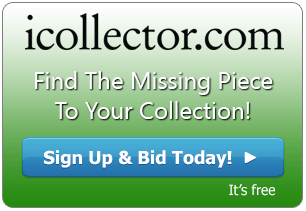 Since those items just scratch the surface of all that will be available in Mimbres, you'll want to log onto iCollector.com to get a rundown on all the spectacular inventory.